Investors may have noticed Thursday's 2.4% decline in the market price for Dow Jones Industrial Average component Pfizer (PFE - Get Report) . PFE was easily the worst performer among those 30 blue chips on a day that saw the average rise by half of one percent. What gives? Well, first one has to review recent news events. Bristol-Myers Squibb (BMY - Get Report) announces a $74 billion stock and cash takeover of Celgene (CELG - Get Report) . Then Eli Lilly (LLY - Get Report) announces that they will spend $8 billion to acquire Loxo Oncology (LOXO . What happens when big pharma needs to grow faster than the industry is capable of organically? Consolidation. The Biotech boogie. On Thursday morning, StreetInsider reported on potential interest by Pfizer in Amarin (AMRN - Get Report) . That stock ran 22% on the day, closing at $18.35. I have criticized some recent deals as having been consummated at levels that I saw as too expensive. Pfizer is one of my names. So, now that this impacts my own book, how do I proceed? My stated reason for being in Pfizer all along has been price stability and income. For those two reasons, this has been an outstanding position that has done its job in a wildly volatile market. The current dividend yield at this last sale is 3.41%, good for a net basis reduction of $1.44 per annum, or 36 cents a quarter. The stock, by the way, goes ex-div this January 31. Do I dump the name now that it is under pressure? If hard news breaks, there could be more downside. Of course not. I just told you why I am in this stock, and that the stock performed well in that function. Do nothing? No. At the end of the day, I am here for one reason... to make money. I am much more likely to add than sit on my hands. What is obvious is that the algos apparently respect Fibonacci when it comes to Pfizer. Outside of the Christmas Eve massacre, this name has traded between $42 and $46 since October. I don't need to buy the stock at Thursday's closing prices, but below $42 I will be there, incrementally. PFE reports on January 29, two days ahead of the 36 cent haircut. On Thursday night, February 1 $42 puts went out at $1.04. 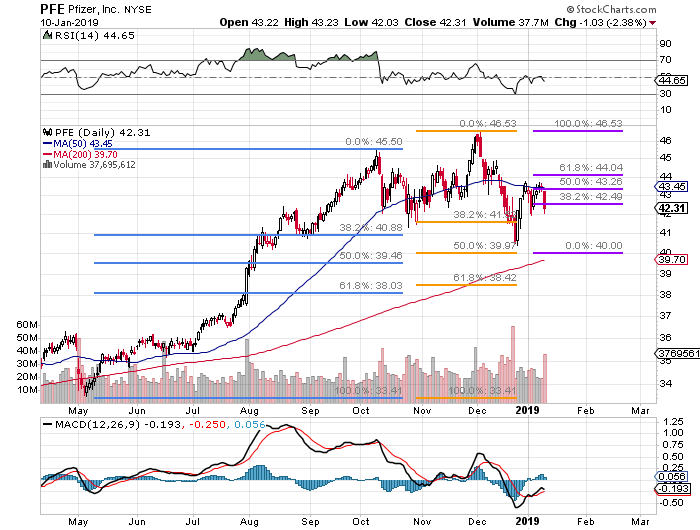 Want to buy Pfizer at a net below $41? That's how. Either the shares are put to the investor there in three weeks, or the investor makes a buck, and takes a pal out to lunch. I am fine with both outcomes. At the time of publication, Stephen Guilfoyle was long PFE equity.